A stunning sunset and the natural landscape of Koh Samui, Thailand serve as backdrop for this couple’s wedding photos. 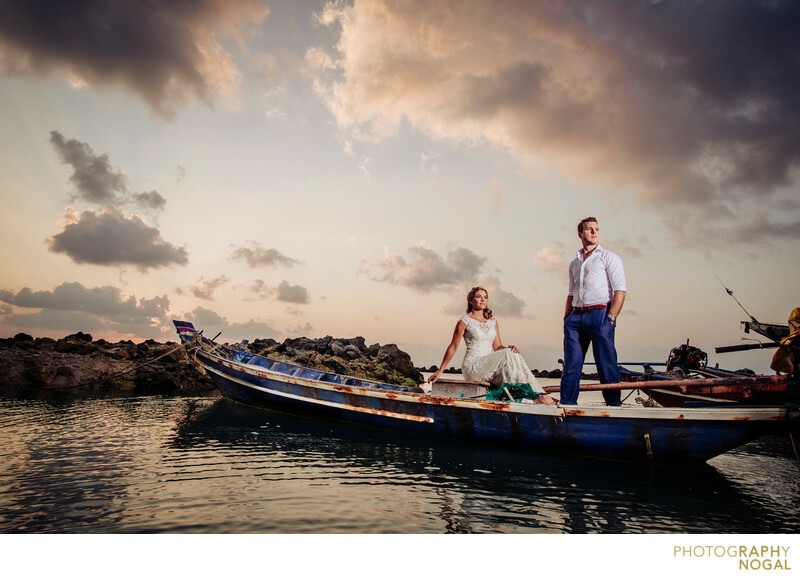 During one of my destination wedding photoshoots, I captured this image of the couple on a Thai longboat, among the gorgeous blue waters and stunning evening sky. Using Thailand’s cultural elements and gorgeous scenery, we staged this photo in a way that inspires a breezy, serene feel. This photo was taken with a Nikon D750 DSLR at ISO 250, f7.1 aperture, 1/200th shutter speed with a Nikon Nikkor 20mm f1.8 prime lens, at 20mm focal length. The lighting used was a Profoto B2 OCF flash, bare and gelled 1/2 CTO to match the orange tone of the ambient light during sunset.